Fees associated with filing industrial design applications in the Czech Republic, as well as other design fees, are available in the fee calculator. The term for filing the design application in the Czech Republic is six months from the priority date. There are no restoration provisions for filing the design application after this term saving the priority right. - image of each design. Multiple design applications may be filed under the condition that all the included designs come under a single class of the International Classification for Industrial Designs (the Locarno Classification). The original of a Power of Attorney simply signed by the Applicant must be submitted within two months from filing the design application. Priority document should be provided simultaneously with the design application or within a deadline given by the PTO. Translation of the priority document is not required in the Czech Republic but can be requested by the PTO. Industrial design applications in the Czech Republic are subject to substantive examination. It is requested at the time of filing without separate request. Novelty grace period provided for design applications in the Czech Republic constitutes 12 months prior to the filing date or priority date, if any. The official fees for grant as well as for the first 5-year validity term are included in the official fee for filing. The validity term of an industrial design in the Czech Republic is five years from the filing date, extendable up to 4 times (25 years in total). For further renewal, the registration holder must file a request for renewal during the last year of each five-year protection period. For foreigners, it is necessary to perform the industrial design prosecution in the Czech Republic through an agent, registered as Czech patent attorney. 1. Online Search Databases: Czech Designs, Community Designs (EUIPO). 2. 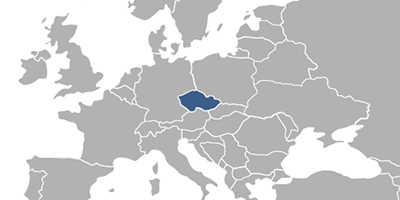 The Design protection in the Czech Republic may also be obtained via Community Design registration.